Slurry seal is a mixture of aggregate, asphalt emulsion, and filler, which are mixed together according to a laboratory’s design-mix formula. water is also added for workability. 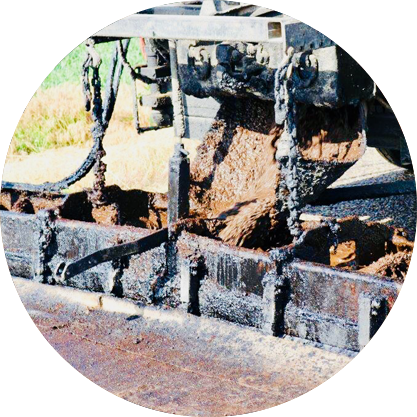 Asphalt emulsions serve as a binder, holding the crushed aggregate together and adhering the new slurry surfacing to the old surface over which it is being applied. Various emulsions and aggregates are used to meet the conditions, specifications, and requirements of individual projects. The Slurry is made in specially designed equipment, either truck-mounted or self-propelled. This equipment carries a quantity of unmixed materials which are blended together in a continuous flow pugmill. The use of this technologically advanced machinery ensures a smooth, consistently uniform mixture. The slurry is made quickly and accurately at the project site. Mixing and spreading are accomplished in one continuous operation, with the surface being reopened to travel within a few hours. Slurry seal is applied to an existing pavement surface by means of a spreader box linked to the surface slurry-mixing unit. The Slurry is introduced into the spreader box, which then lays down the slurry coating as the mixer/spreader is driven forward. The box is capable of spreading the slurry seal over the width of a traffic lane in a single pass and is constructed so that close contact with the existing surface is maintained. Trained operators continually monitor the automatic mixing procedure. 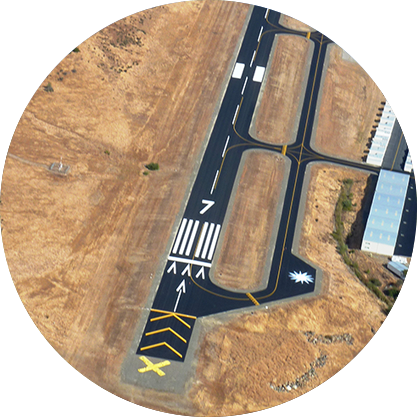 Other personnel clean the surface before slurry applications, barricade the street, inspect the operation in progress for uniformity, clean metal utility covers after application, and complete slurry seal spreading in an area inaccessible to the spreader box. Emulsions of varying composition and setting times are mixed with any one of three grades of aggregates to create slurry seal mixes for specific purposes. Aggregate types are I (fine), II (general), and III (coarse). Fine aggregate mixtures are used for maximum crack penetration and sealing in low-density/low-wear traffic areas. Type II aggregates are the most commonly used and are widely employed where moderate-to-heavy traffic is found. They seal correct moderate-to-severe raveling, oxidation, and loss of matrix, and improve skid resistance. Type III corrects severe surface conditions — preventing hydroplaning and providing skid resistance under very heavy traffic loads. A slurry seal for nearly any need or condition can be custom designed to satisfy the most difficult requirements. 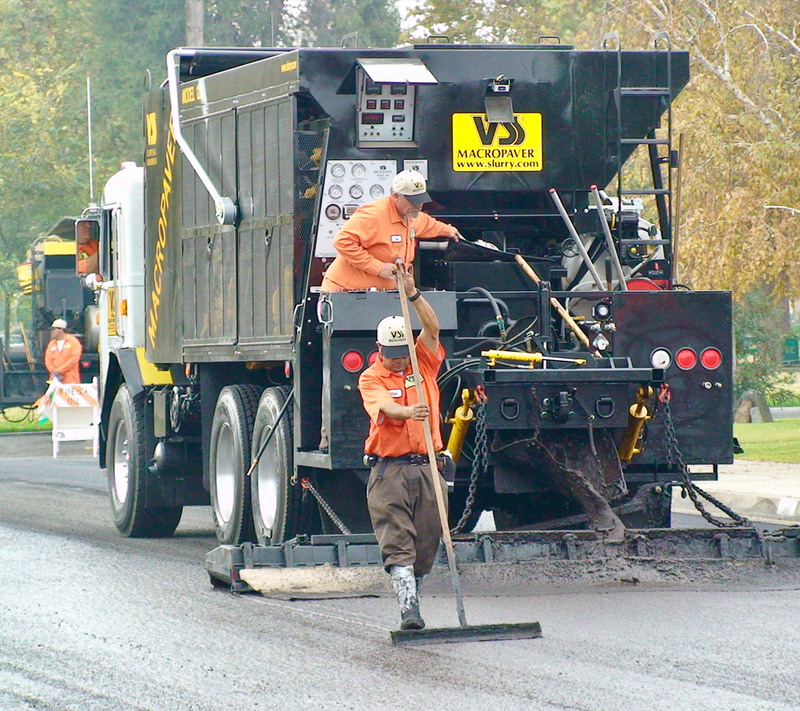 As the most versatile of any pavement surface treatment system, slurry seal is also unique in its ability to deposit a durable bituminous mixture in accordance with the demands of a variably textured surface – filling cracks and voids, sealing weather-tight, and providing color and texture delineation in a single pass. Economical to install, highly cost-effective to use. Used over newly laid pavements, the slurry seal will prevent surface distresses such as the effects of weathering from occurring. Oxidation, loss of oils, loss of matrix, and embrittlement of the mix are minimized. It also provides special durability and texture not available in the underlying mix. 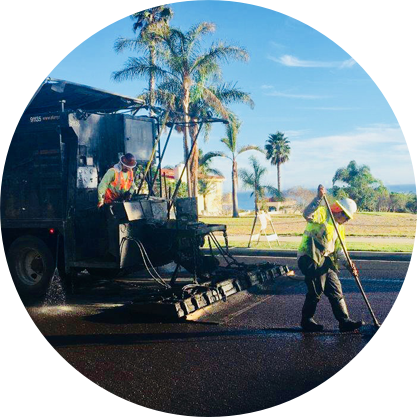 Existing distresses in older pavements — surface cracking, ravelling, loss of matrix, increased water and air permeability, and slipperiness due to flushing and aggregate polishing — can be corrected through a slurry application. Waterproofing is also achieved, preventing further deterioration. An all-weather, long-lasting surface is created that offers skid resistance and improved handling characteristics for drivers. 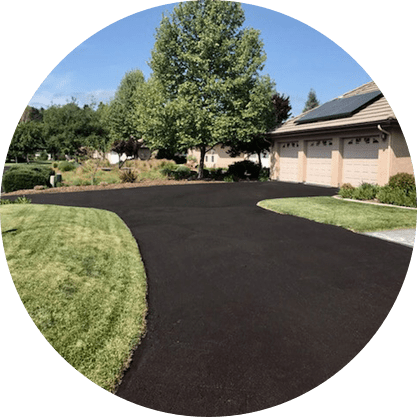 With one simple application, existing pavement receives a new wearing surface of uniform black color and texture. Enhanced appearance means increased property value, marketing potential, and buyer acceptance. Thoroughfares, shopping center parking lots, and other public or commercial pavements treated with slurry seal become more attractive and eye-appealing.